The Bull Canyon Dinosaur Tracks are located at an elevation of just over 8,500 feet in the Manti-La Sal National Forest near Moab, Utah. Several theropod trackways can be seen at the Bull Canyon site. The tracks date back to the Jurassic Period, 145-~200 million years ago, when the current area was a shallow coastal plain that was just above sea level. To get to the trailhead from Moab follow Highway 128 east for 15.5 miles to the Castle Valley/La Sal Loop Road turnoff. Drive for another 10.7 miles to where the Gateway Road begins. 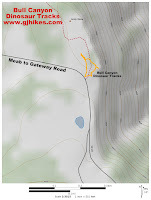 Follow the Gateway Road for just over 5 miles to the trailhead. The entire route to the trailhead is paved. The Bull Canyon site has been spruced up with a graveled pathway and a new fence and signs. This sign even mentions new details about the type of dinosaurs that made these tracks that were mostly unknown until recent years. Some of the tracks are more complete looking than others. We have noticed that studying partial tracks in conjunction with others that are well formed makes it easier to identify partial tracks when hiking in other places. As the sign mentions; the tracks seem to walk right off the cliff into Bull Canyon even though the canyon didn't exist at the time the dinosaurs made the tracks. The rocks around the edge of the cliff are fractured so one of these days, as the canyon continues to widen, these tracks will end up in the bottom of the canyon. Care should be taken around the edge for that reason. Especially if you have small children with you. There is another track site inside of the fenced area. Here there are even more full and partial tracks. Besides the Bull Canyon Dinosaur Tracks there are other dinosaur trackways and track sites around the Moab area. Several of them can be toured all on the same day. 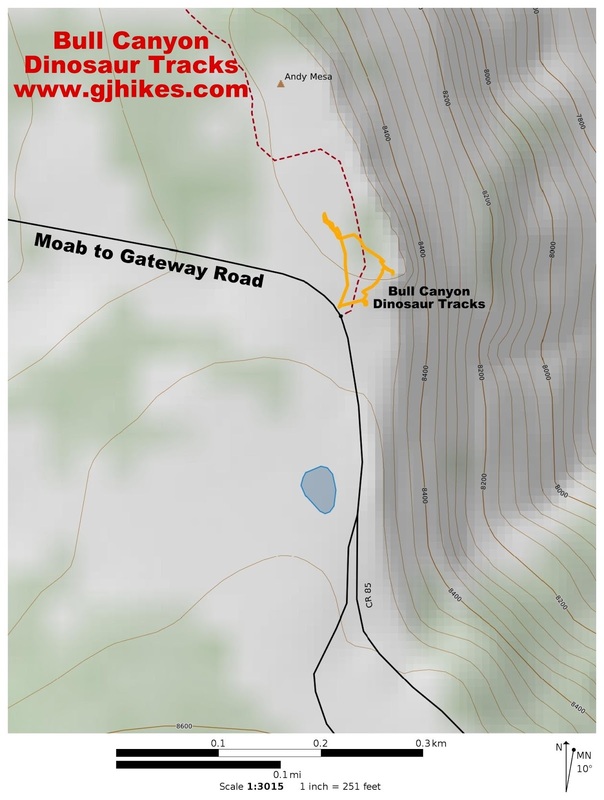 North of Moab there are the Copper Ridge Dinosaur Tracks, the Dinosaur Stomping Ground, the Willow Springs Dinosaur Tracks and the Mill Canyon Dinosaur Tracksite. Also of interest would be the Mill Canyon Dinosaur Trail, the Poison Spider Dinosaur Tracks, and for the ultimate dinosaur learning experience, the Moab Giants Paleo Safari. There are several other trails in the Moab area where we have taken pictures of dinosaur and alligator tracks that are more difficult to get to but those listed above should be enough to keep a person busy for a day or two. As far as the Bull Canyon Dinosaur Tracks go, if you would like to see them for yourself then all you have to do is 'Take a hike'.